As regular readers may have noticed I was not actively in recent weeks. Busy with other things, including my study. My "new" desktop computer has no serial connector anymore. The cables I have for my Yaesu FT817 and FT7800 are not directly used on this computer. A serial-to-USB cable that I had did not solve this problem. In the Far East I bought 2 new programming cables with a USB connector. After installing the driver, I could program my FT7800. I wish everyone a good 2011 with: Health, happiness and fun with the things you do in your leisure time. In 2011 you see me again with regular messages. This is a project for 2011. Among the other activities of this weekend, I listened to the "Limerick Sudden receiver". I had a wire antenna of no more than 5 meters. Despite this short length for this frequency signals were heard. I heard Sweden, United Kingdom, Italy and Belarus (EW8O). This last station had a way of qso's which seemed more like a contest. Something I think this is not needed on this band and in my eyes undesirable. I felt again the early years, I started as a SWL (NL-9514). Wednesday, December 8th, there was a local meeting where the ability is to get the QSL cards from the buro. Through other activities, I was not able to go. The cards are taken by an amateur friend and I received it today. 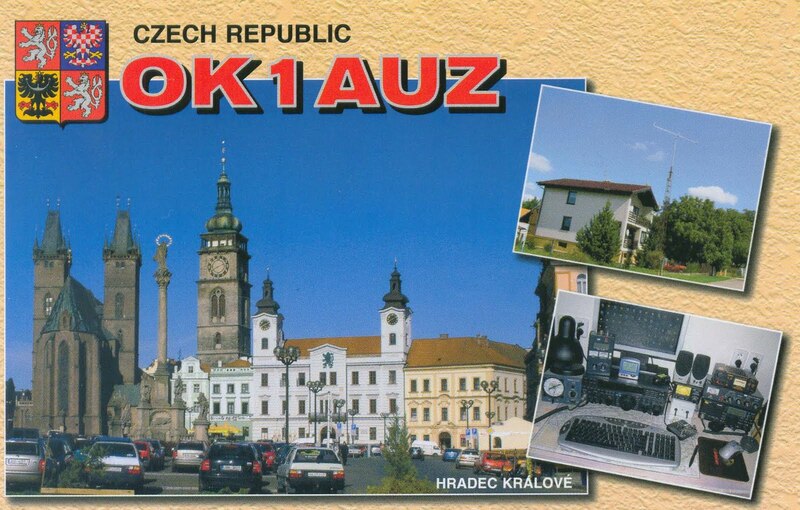 There were some nice QSL's from QSO's made with the ATX1080 antenna at home and from the field activity in Maurik, last summer. The project "Sudden Limerick receiver" has stagnated for several months but now the receiver is ready. Making the case was a precise job and fortunately, I had some help. The description for the casing to assemble seemed easier than practice. I have a few minor details changed. The RCA chassis for the antenna changed into a BNC. The connection of the print to the BNC, is made with RG174 coax. Next week I will try to publish some listening experiences. This will be real very soon. announcement of the Dutch government. During our stay in the Algarve, Portugal, we saw some lighthouses. "Farol da ponta da piedade"
The highlight was the lighthouse "Farol de S. Vicente". It was open to the public, a unique. a few days before my trip to Portugal, I was at the monthly meeting where I can bring and get the QSL. There were a fair number of QSL's for me, including some remarkable. 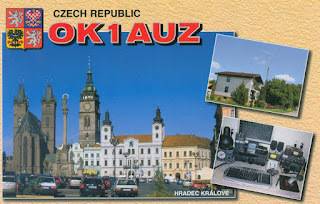 There were QSL's of the QSO's with OK1AUZ and 8S0C. Both QSO's are made with my FT817 + ATX1080 antenna and 2.5 watts output. My setup was on the dinertable. Komend weekend vindt weer de jaarlijks PA-beker contest plaats. Zaterdag 13 november het CW gedeelte en zondag 14 november het SSB gedeelte. Het reglement van deze contest vind je hier. Helaas ben ik er dit jaar niet bij. Volgend jaar hoop ik weer in de top 3 te eindigen (CW QRP). Yesterday I was at the annual "Dag voor de Radio Amateur" meeting in Apeldoorn. With the CGR we were there with an information stand that I have manned with the others most of the day. In between there was the opportunity to walk around past the stalls. This time I barely bought, there are still many projects to finish. 8 tickets for the lottery, I bought a commissioned material for a ZS6BKW antenna. I have a monitor sold and further has the new handbook from the VERON. Besides a lot of familiar spoken. The next 2 weeks I am free from my work would add little to the radio hobby doing. I also have a trip to Portugal. After a long time I'm qrv again on 30M with WSPR. This time with my FT817nd with battery power and the ATX1080 antenna mounted on the back of the set. Mostly just listen, otherwise the battery is empty very soon. This weekend is Heritage Day in the Netherlands. This means that many old buildings opened to visit, for free. Yesterday I was one of the volunteers at the lighthouse in Noordwijk. In the afternoon I made some cw qso's, with the call PG6N, on 20 and 40M. The rest of this afternoon I guided the visitors at the entrance. At the end of this afternoon there was for me the ability to take some pictures of the lenses with lamp. During the NVV lighthouse day on April 10 of this year was this not good possible. Thanks to the crew of PG6N. Yesterday I started installing the capacitors on the board of the "Sudden Limerick receiver" project. All capacitors (18) are mounted, now all components on the PCB. The next step is to build the enclosure. The PCB with components is the bottom of the enclosure. When attaching the front and back, the connection to the antenna connector and dial must make. This also applies to the on/off switch and volume control. The on/off switch, switches the powersupply between the print and the 9 volt battery. During the field activities of August 15, we learned that it's beter to move the additional support from 6 tot 7 meters. The additional support is now on 7 meters and the antenna is mounted on 9 meters. With these changes it's a strong construction. The mast is not crooked anymore. Today, in the last 30 minutes of the fieldday contest, I made on 40M 8 QSO's: Czech Republic, England (4x), Denmark (2x) and Germany. After the contest ended I responded to a CQ of GB4AC, on the Isle of Wight, and made a "normal" qso. On 20M I heard many Japanese in the AA contest, but unfortunately I could not work them with 2.5 watts. On 20M I worked one station in the AA contest, RA9AE. All qso's made with ssb. 2,5 watts, powered by car battery. ATU: homemade from a Howes kit. Thanks to Eric, PE1FES, for support. 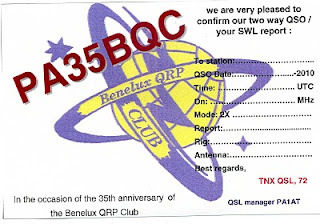 35 anniversary Benelux QRP Club. 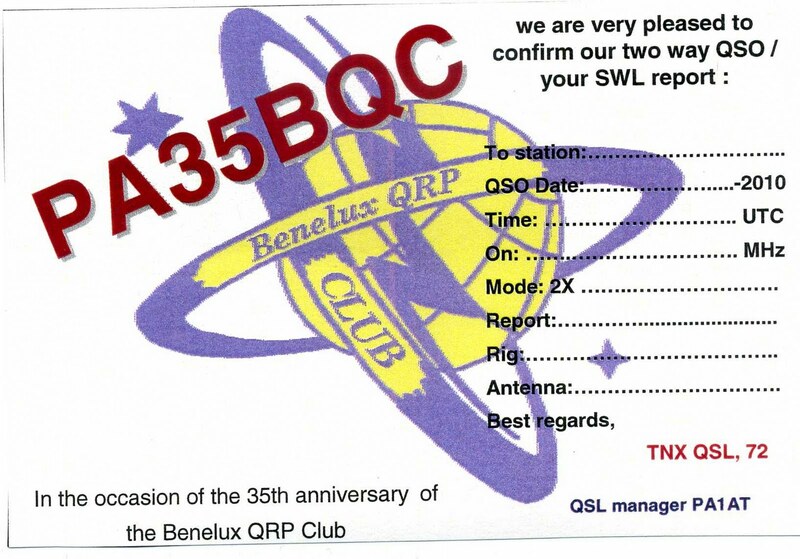 The Benelux QRP Club celebrates his 35 anniversary. To celebrate this there is a special call active from September 5 to October 2 2010. Several members of the club are active with this call around the QRP frequencies on HF. More information is available at: PA35BQC. QSL manager is PA1AT. This weekend I continued with the "Sudden Limerick receiver" project. I do this in a leisurely pace and spend my free time also with other things. So I have watched a DVD of Michael Pailin, "The circkel around". From the 3 DVD's in the box I have now seen 2 episodes of the first DVD. Yesterday I soldered until all resistors were mounted. At that time, the 2 IC feet, 3 coils and resistors mounted on the PCB. Today I have some capacitors soldered. When I soldered the rest of the capacitors all components on the PCB. This morning I began with the further building of the "Sudden Limerick receiver. Meanwhile, all (6) resistors soldered. It's tougher than I thought to get everything straight on the board. It will be my limited experience. Tomorrow publish a photo on the blog. Yesterday, I received the Electron magazine of the VERON, the September issue. Today I received also the "Nieuwsbrief" of the Benelux Qrp Club. Both magazines are in Dutch. So enough to read this weekend. The last 1,5 weeks I have nothing done with the radio hobby. After the experiments in the field, I filled my leisure time with other pursuits. My 2 meters transceiver was sometimes standby in the evening but made no qso's. Last Saturday I was with my girlfriend in the Zoo of Arnhem. For me it was more than 15 years ago that I had been here. The pictures are a little compilation. After buying a new charger + batteries, a few weeks ago, I can shoot longer with the same batteries. Saturday, I'm going to spend time to the Limerick Sudden receiver project. Last Wednesday, the predictions for the weather where not so good and we decided to do this activity yesterday. We were lucky: sunshine and good temperatures. The purpose of this event was to build up the portable mast and see if the additional support is good enough. At about 6 meters height, we made an extra point with 3 ropes. It looked good and solid but from this upper point of the mast was pretty crooked. The idea is to make the support more higher to obtain a better stability.The upper part have Eric, (PE1FES) and I let down, there was now about 6 meters mast on. The mast was now stable, without curves. The suspension point for the variation of the G5RV/ZS6BKW (2 times 7.77 meters) is here by also lower. In both situations, I made some qso's. On 20M a cw qso with I6WJB in Pescara. This was my first cw qso while I was standing, we forgot the seats. On 40M, I made qso's with: F/PH2CV/P (cw), SP9KAT (ssb) and SP9WZS (cw). TRX: FT817nd with internal battery + later a external battery. The output power was only 2.5 watts. We have had a lot of fun! Wednesday evening I went to the monthly meeting where the QSL manager for our region is always present. This time there was a nice pile of cards for me. In 2008 I had the opportunity during the lighthouse weekend to activate the Lighthouse of Vlieland. Due to circumstances we had only 100 qso's made and yet I wanted a special qsl. I looked around on the Internet and saw that the most companies had the minimum order of 500 cards. In Israel I found Global QSL, they have the possibility to make 100 cards for a reasonable price. After the draft, I had the log in ADIF format uploaded. From Israel, the cards also sent to the qsl buro. 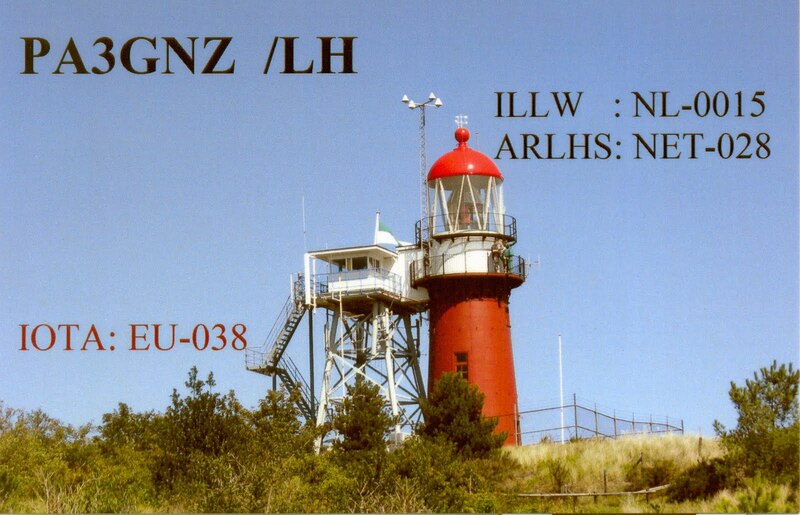 I sended myself also, as a control, a qsl via the buro. This card was between the pile of last Wednesday. Another visitor who had a qso with us received also the qsl. Furthermore, quite a few qsl's from the United Kingdom. 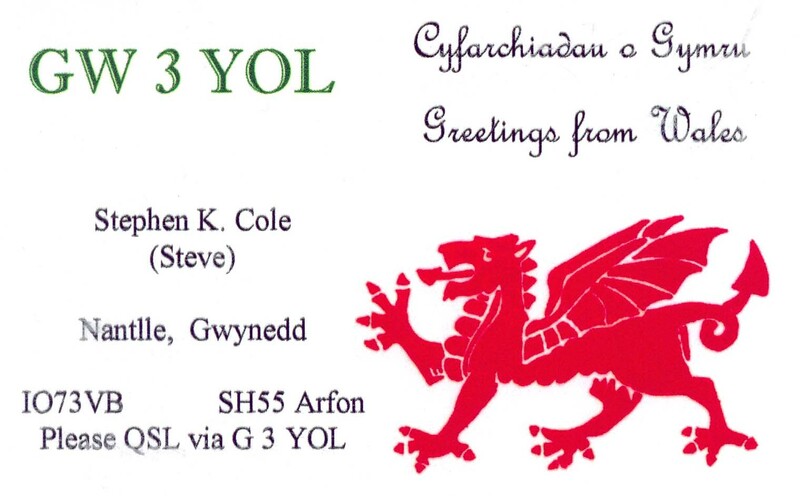 Likewise, this qsl of GW3YOL. This was a 2 way QRP QSO. We both worked with a FT817, 5 watts output. This morning I setup my portable situation on the dining table. This means the FT817nd with internal battery and on the back of the transceiver the ATX-1080 antenna. First it seemed very quiet on 20M but during the morning I heard a few signals. While I had other activities in the house, I leave the transceiver on 14.060. Suddenly I heard HB9DAX CQ'íng. After one reply Man(fred) came back for me. We made a nice qso, the transmit speed of Man(fred) was a little bit to high for me. So, I have to concentrate me more than normal. When I removed my setup from the table I wanted to move in the telescope. This is always stiff and one of the thinner parts nodded. It can still be moved in and out but it is not pretty. 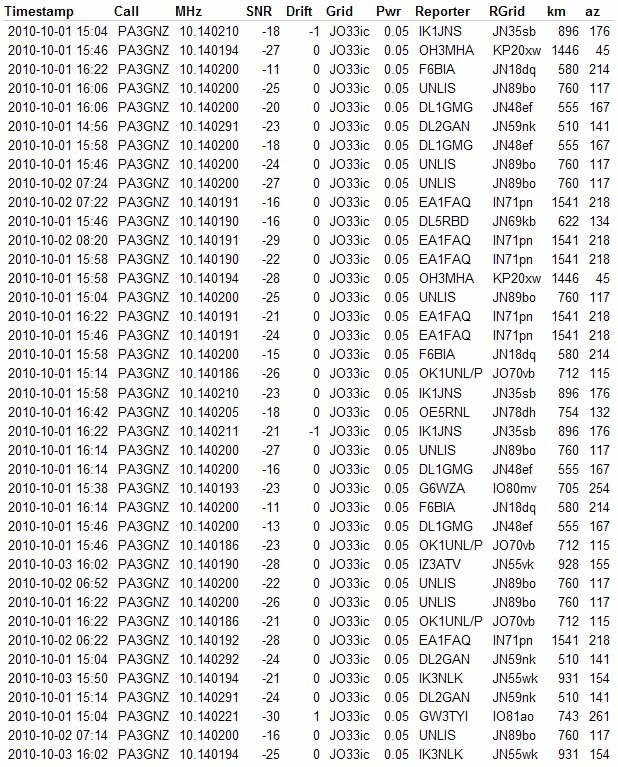 Yesterday morning around 8:00 local time, I heard during my breakfast signals from the beacon I0JX/B on 6 meters. Unfortunately, no further action was heard and gone outdoors for other activities that day. Today I borrowed a swr meter to see what the swr is of my homemade 2 meters J-pole antenna made of 300 Ohm ribbon cable. The swr was reasonable, 1:1.4. The J-pole antenna hung in the doorway to the balcony. I made a qso via the repeater of Amersfoort (PI3AMF) without problems, 5 watts output. The other station told me that the swr is improving by an RF choke. I got a phonecall and the qso was abruptly ended. Google gave me no answer for an RF choke for this situation. Any ideas? It's almost a week ago since I put my last post on this blog. This means that there was't to much time for the radio hobby. Last week there was a chance of Aurora Borealis by an eruption on the sun. Unfortunately, the Aurora was to weak for me in JO21RV to hear signals on 6 meters via this propagation. The antenna for 6 meters has not stood on the balcony for a few weeks. This antenna is a 5/8 wave for 2 meters. With a piece of extended it's now a fourth wave for 6 meters. The extension has now made a final. This year I made a lot of qso's via Es with this antenna. Thanks to Eric, PE1FES, for the mechanical work. This week I walked around in my house with my camera and came up with the idea of yet another new picture of my homebrew corner. This is the result. On the desk are the components of the Limerick Sudden receiver project I'm doing. As the manual shows I started assembling the IC holders for the LM386 and NE612. I haven't found more time in the past week for this project. Wednesday afternoon I had a qso with SM3YQX/4. Lars Erik, 30 km west of the town Mora. He worked with 100W in a dipole, I with 2.5 W in the ATX-1080. Today I have made a cw qso on 20M with HA8LTQ. It was a "normal" qso where we both could share our details, like: name, name of the town and the equipment we used. This was on my side the FT817nd with 2.5 watts and the ATX-1080 antenna on the back of the set mounted. Today I prepare the sides of the print and enclosure for the Limerick Sudden receiver with a neat file. Next week I can start soldering, as there is time. My activity of this day. 10 segments of the telescope extended, counterpoise for 17M in use. Then I made connections with: Poland, Sweden and the Czech Republic, unfortunately, no stations on an island. My conclusion is that this antenna on 15M will work. 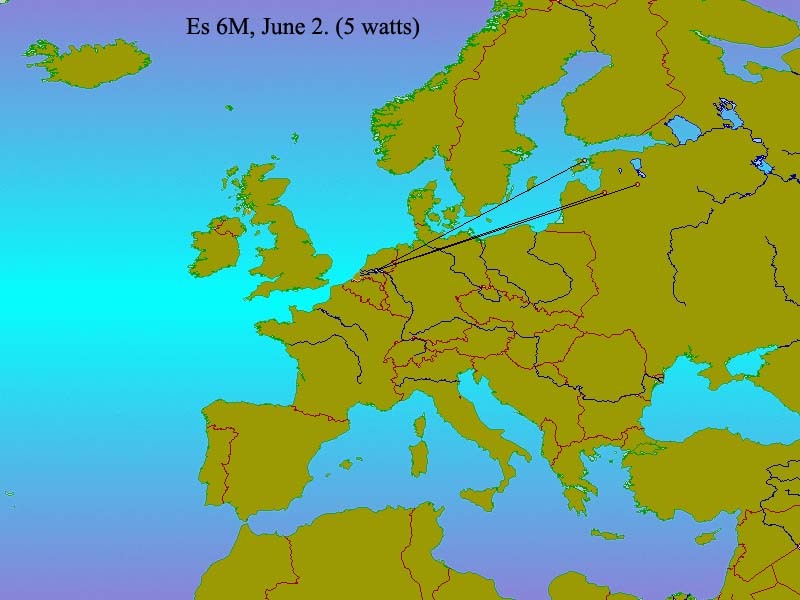 On 20M I worked 2 stations in Romania and Sweden, all with SSB and 2,5 Watts. Today I did nothing with the Limerick Sudden receiver project. Yesterday I only snapped the front and back panels from the mainboard. Tomorrow I smooth the snapped edges with emery paper. Yesterday I opened the envelope of this kit to verify that all components are in the packaging. In the manual there is a list of components and I soon found out that all these components are present. This weekend I read the manual and make a plan how I going to start the building. My idea is to make the wiring to the antenna connector with RG174 coax and not with the twisted wire which is written in the manual. For the antenna connector, I like to use a BNC chassis instead of a RCA chassis. I'll keep you posted about this project. Last weekend I took the time to experiment with the ATX-1080 antenna. My expectations of this type of antennas have never been high. Now I have a somewhat different view. Almost 3 segments of the telescope extended, counterpoise for 20M in use. 10 segments of the telescope extended, counterpoise for 20M in use. 5 segments of the telescope extended, counterpoise for 17M in use. 8 extended segments of the telescope, counterpoise for 10M in use. 10 segments of the telescope extended, counterpoise for 10M in use. On the Friday before I made 2 QSO's with Lithuania on 30M. At all QSO's I had an output of 2.5 Watts. My FT817nd was on the dining table (see) with rear mounted antenna. The counterpoise lying on the ground. Last Friday I received the kit of the Limerick Sudden receiver, a quick delivery from the GQRP club in England. I've chosen for the 30M version. Yesterday I experimented with a counterpoise for the various HF bands. This has not gone to no avail. In the next week I will describe my findings. Now I go with a book sitting in the balcony, it's sunny. Last week I bought a second hand ATX-1080 antenna for my FT817nd. Yesterday I received it by the mail and today I had the time to try this antenna. With a cup of coffee I sat quietly at my diningroom table and listened to 20 meters, swr reasonable. I heard the special call SI9AM, this time with ON5RZ as a guest operator. A lot of stations called him and it seemed that he not heard my QRP signal. Nevertheless, my patience was rewarded. Raf said my call with an error and I answered to it. He corrected my call and we could made a nice QSO. Details of my setup passed and I told my name. Who knows what for fun this antenna gives me even more. This week, no radio activities. The weather is too hot for hanging over the soldering iron and I am home with a painful ear infection. By post was the latest Journal of the club GQRP 'Sprat'. A Magazine with always interesting articles. By this time the announcement of a kit what the GQRP club is sold. The Limerick Sudden Receiver. I wonder if there is a possibility for the FT817nd to receive 4M signals. Any ideas? Saturday afternoon, I was listening on 6M because there were conditions. I heard that there was a contest and on the internet I found out what kind of contest this was. I came to the following information. In this contest you change a report, serial number and locator. Among the other activities, see previous posting, I have made a total of 20 QSO's. In this picture are the lines through the various contacts visible. Clearly the most possibilities were to eastern Europe. The farthest distance was with UU9A in KN64SM, over 2000km. I made the qso's with cw/ssb and the most with 20 watts, 2 with 10 watts. From the 20 qso's there were also a few new squares: JM68, JN94, KN44, KN64, JO91 and KO14. Today I repaired my Genesis Q5 transmitter. First I had to remove transistor T2 and then I could remove the IC. Then I placed the new IC and I measured that the oscillator was working, yes! Now I could replace transistor T2 and the transmitter was working again, the frequency 10.11574, it's too low. (When you've read my previous article about the Q5, you could see that with the value of 33pF (C7) the frequency was nearly 10.117 Mhz. The 33pF which I installed today was another. I received the advice to change capacitor C7. First I replaced this by one with a value of 22pf. I measured that the frequency was 10.12012, much too high. The next step was placing a capacitor with a value of 27pF. The transmit frequency is 10.11595. This deviation from 10.116 Mhz is acceptable for me. I finally placed the 27pF capacitor. Last week I made a J-pole antenna for 2M. This antenna is made of 300 Ohm ladder-line I found in my junkbox. Yesterday evening I used the antenna indoors, hanging from the curtain rail, and could reach PI3AMF, a repeater in Amersfoort. A distance of 28 km. I used my FT817nd with 2,5 watts output. This weekend I want to measure the swr with an external SWR meter. The rest of this week I had no time for the hobby. 18:30 UTC. I saw that my swr meter is not suitable for 2m, stupid of me. Now I should just borrow one from a colleague in the neighborhood. How long does a computer live? Yesterday I came home after a weekend in Utrecht. When all things were cleaned up I started my computer. There appeared some reports that I made me not optimistic. After a restart everything seemed to function normally. This morning started the computer again but this time the monitor was just on and off again, the situation remained so. Checked all cables but this did not solved the problem. Luckily I have a spare monitor and it works simply. Unfortunately, this screen is smaller and the resolution has to get used to. My computer is almost worn out after 5,5 years loyal service. After my weekly sports I came home and heard on 6 meters different beacons, there was again sporadic E. Among other activities, I worked through some stations. OY1CT in IP62LC, In the past I worked this station also on 30M. And finally for this day in UX2SB in KN28IX, a new square. Yesterday evening I visited the monthly meeting in this area where the QSL manager of R30 is always present. 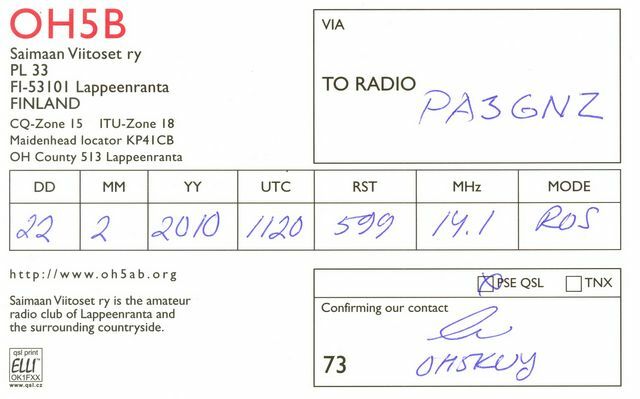 The last time I made a lot of qso's on 6 meters and gave this cards to the manager. What I got back was not much, only 2 cards. 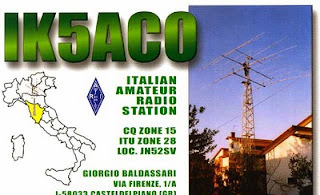 A card of IK5ACO. Last year I worked this station on 6 meters. With this card the square JN52 is now confirmed. 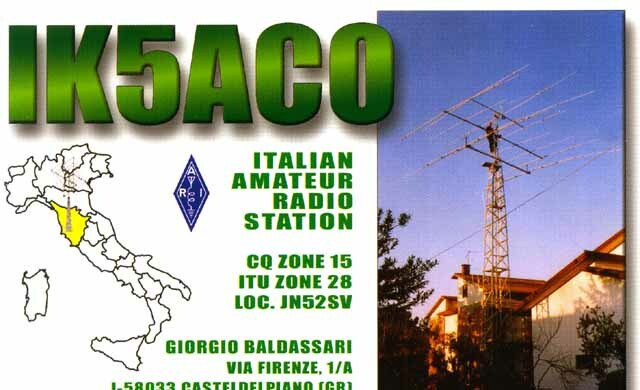 The other is a qsl of OH5B. This is a confirmation of the first qso I made with the new digital mode ROS. I wrote about this for the first time on February 22 this year. After a few contacts, this mode is no longer used by me. a great day with Es on 6 meters. Today was a day with almost the entire day Es on 6 meters. 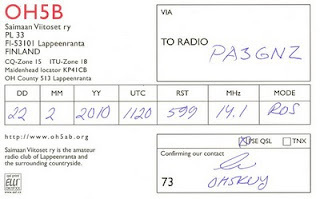 I made my first qso at 7:20 UTC with Poland. The last QSO for this day was at 10:24 UTC with 2M0DDS in Scotland. In the meantime I have made a total of 8 QSO's and did some other things in the house. I made the qso's with ssb/cw. My conclusion is that I make the most qso's with cw. This afternoon I had my weekly sport. At present there is still Es on 6 meters but there are also other things in life than just this hobby. Do I'm a square hunter? This day began sunny, although the sky was overcast. Readers of my blog will sometimes wonder if I'm square hunter on 6 meters. No, not really. This is something left over from the days when I was a DX'er on 2 meters. I am not specifically looking for new squares but it's always nice when a new square can be worked. Today I worked around 10:30 UTC with IK5ZWU in JN53VB, a new square. Then it was quiet again for a while and on 12:00 UTC I was able to work with EI2JD in IO63VS. Not only a new square, Ireland is also a new country for me on 6 meters. The rest of the afternoon I visited family and did some homebrew. The 2 meters fox transmitter has another crystal obtained. The transmit frequency is now 144.930 (AM) Mhz. From my 30 meters transmitter kit, I wanted to try move the frequency closer to 10.116 Mhz. The transmitter was first OK and suddenly nothing. Perhaps somewhere in the circuit a short circuit. I have yet to find out where. The stabilizer for 5V works well in any case, I have this measure. At 17:41 UTC suddenly I heard the signal from OH4KA in KP31WN. It was easy to work him. Furthermore, I heard some beacons but no other stations. 6M and my own fieldday. This morning I was out of bed early and first listened to 6M. The band was quiet but around 7:30 UTC I could work with IK4AUY in JN54QM (SSB), a new square. The rest of the morning remained rather quiet here on 6M and have other things in the house. On the balcony with a cup of coffee and magazine I enjoyed the sunshine. By 15:00 UTC I went into the field, the same location as on May 23 Today the conditions were not so good as that day and it was this time not so successful. 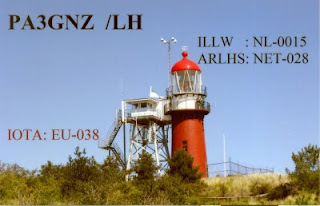 I worked with II0CC who was working in a contest and later with IQ8MO/3 who was active from Punta Tagliamento lighthouse with reference ITA-148. A nice qso because lighthouses are another hobby of mine. The rest of the time I had the idea that I was returned to my SWL period. While listening I heard Mongolia, Japan and Taiwan on 20M. I started this hobby as a listening amateur with number NL-9514. 6 meters was completely silent, I almost had the idea that the antenna was not working. I've heard no beeps and whistles on 6 meters in that area. By 2:30 p.m. UTC I went home. At 5:00 p.m. UTC there was a revival of 6M and worked with 2 station from Sweden. JO88 is another new square for me. All day there were Es clouds over Europe but not so good for the Netherlands. In the evening I often listened and heard weak signals. Around 7:15 p.m. UTC the signals were louder and I could work via cw with YO7LCB in KN15OA and YU7AU in KN04HU. The qso with YO7LCB gave me a new square. With good Es propegatie the last days it seemed a good idea to try WSPR on this band. Through the WSPR site I saw a few station was QRV but despite this I wanted to try. Result: I have no station heard at times that I transmit no one heard my my signal. I was active with WSPR from Thursday evening till Friday afternoon. Kees PA3DEB, wrote me this afternoon in response to my earlier post about the Genesis Q5 transmitter. The oscillator is not on 10.116 MHz, which wele desirable. Kees advised me to change the value of C7 in order to be more close to this frequency. Active on 6M with QRP. Today there are again conditions on 6 meters. My goal for today is to make qso's with QRP (5 watts maximum). I made 3 qso's with a power of 5 watts. 2 stations from Latvia and one from Estonia. 2 of the 3 qso's made with cw the other with ssb. It was more difficult then yesterday and on the moments that I listen there where not so many signals like yesterday. I listen also in the beacon part of the band and heard a few signals. I put the different frequenties into the memories. I previously wrote about this project. During the construction there were two parts in the package down. I've emailed the supplier from the USA but has so far not responded. Fortunately, there is a Dutch amateur that I could offer a helping hand. Today I received by mail the two missing parts. Thanks Frans. I can go on with this project. 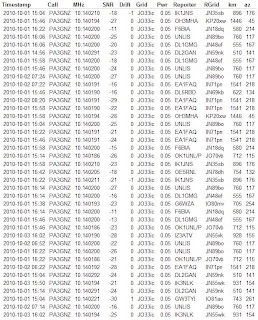 A day with strong signals on 6 meter. It seems that the signals are getting stronger each day on 6 meter this Es season. Today there were a lot of strong signals heard on SSB / CW. In about one hour time I worked the following stations. SM7FJE - JO65ML, ssb (new square). SF4J - JO79NC, with 10 watts cw. I wonder what tomorrow brings us on 6 meters, I have a day off.